UK's Lindsey Mullis demonstrates an exercise to Cody Woolumns (front) and Morgan Turner in a training session. LEXINGTON, Ky. (July 12, 2018) — The University of Kentucky Human Development Institute (HDI) has received a three-year grant totaling $600,000 from the Administration on Community Living. 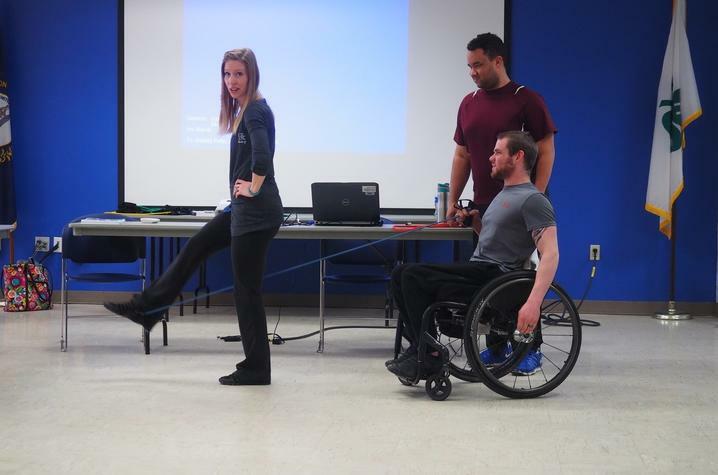 The project, Wellness Edge, is a Paralysis Resource Center State Pilot program grant. It will build connection within local communities to enhance and facilitate access to recreational programs to better serve people with paralysis and their support networks. This fall, Wellness Edge will provide grants of up to $25,000 to community organizations that provide organized activities that are intentionally designed to benefit individuals, groups or communities. Chithra Adams, who will lead the project at HDI, said, "I am really excited to launch this effort for Kentucky. It will provide opportunities to develop new community partnerships and stimulate innovative ways to better serve people with paralysis and their networks of support." Assisting Adams in the project are Jason Jones, founding member of the Kentucky Congress on Spinal Cord Injury, and Lindsey Mullis, HDI’s health and wellness director. This team will provide technical assistance and collect data that will ultimately help improve health outcomes for people with paralysis and build stronger, more inclusive communities. Community grant applications will be available on the HDI website (www.hdi.uky.edu) in August. An estimated 5.4 million people live with paralysis in the United States. The leading causes of paralysis are stroke, spinal cord injury, and multiple sclerosis. People impacted by paralysis are more likely to have health risk factors, such as being overweight, smoking and not being active; which put them at greater risk of developing secondary conditions such as cardiovascular disease and diabetes.